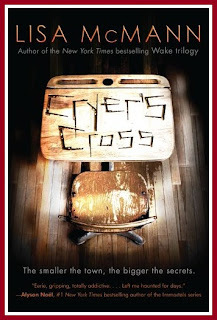 Cryer's Cross was a pretty creeptastic book! I wouldn't say that it was scary, exactly, unless you are easily scared, but it definitely has the creepy factory going on. I read this book in a few hours one evening, and didn't put it down the entire time. And, I read it on my computer, which I don't really prefer, so you know it had to be extra good, to keep my attention. 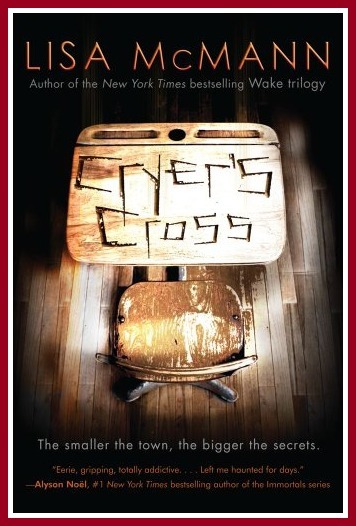 Cryer's Cross was one of those "backwoods small towns" where everyone knows everyone, and no one has any secrets. So when kids start to go missing, the town immediately looks to the new guy in town, Jacien. Even when he is cleared, Kendall still has her suspicions. But that's because Kendall's OCD won't let her stop thinking about the kidnappings. She thinks about them constantly. Which is why Kendall is the one who notices the strange graffiti on the desk that one of the missing teens, her best friend Nico, sat in. She knows the graffiti wasn't there before, and she feels like it has some connection to the kidnappings, though she doesn't know what. It kind of reminded me of MONK (the t.v. series), how his OCD enables him to notice things about a crime scene that others miss. I do think that people with OCD would make excellent detectives! They just notice things that others don't. The main character, Kendall, was SUCH a unique and interesting character! She was certainly not the normal, beautiful person who's got it all going on type of girl. Kendall has OCD, and I just loved reading about the compulsions that she had to deal with on a daily basis. Counting her steps, locking the windows, getting to school before everyone else so that she could arrange the desks properly and line up the markers by ROY G BIV color patterns. I think we all have a little OCD in us, but to feel what she was feeling the day she got to school late and couldn't go through her OCD routine, was just crazy! I felt like I had prickles all over my skin, needing to go and arrange things myself for her! Haha!! I did enjoy the slow progressive relationship between Kendall and Jacien, but there's no other way to describe Jacien at the beginning of this book, but a big, huge JERK! He's angry that he had to move to Cryer's Cross and he's going to let anyone and everyone know it. Over time, though, he and Kendall start to connect, and Jacien starts to change. I wish that he wasn't such a huge jerk at the beginning, because it just kind of goes to a person's character, how they deal with adversity, and Jacien didn't deal well. But he did end up growing on me, even though I'd NEVER want my own daughter to date him, I could understand why he was the way he was. And in the end, I thought he was really good to and for Kendall, assuming he doesn't revert to his jerk-ness the moment things don't go his way again. The only thing I wasn't crazy about (other than the profanity, which just isn't my thing) was the way that Kendall's name was constantly used in the writing. I know it's third person, and usually it doesn't bother me, but I felt like it was weird. *Kendall went to the store. Kendall had a bagel. Kendall thought about life. Kendall had to lock the windows three times each. * I had a serious deja vu moment, thinking that this writing style bugged me before. When I sat and thought about when that was, I realized that it was in the WAKE series. So, I guess that's one little thing that bugged me, but the story was so good, that I got over it quickly. Overall, I thought this was a very creepy, often disturbing, and somewhat sinister book that had me turning the "pages" until I was done. The storyline was unique, and the mystery was unsolvable until the very end. 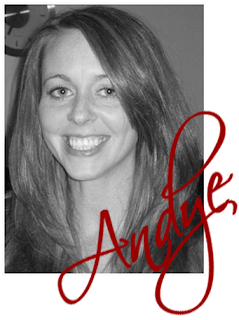 For more details, check out Cryer's Cross on Parental Book Reviews. You had me at "creepy." I'm going to have to read this one. Very good & thoughtful review. Please tell me the author's changed her way of writing because I completely disliked it in Wake but I liked so much this countdown widget, the booktrailer, the story and your review of this book that I so want to read it! Jam, some of the writing is the same, like what I mentioned in the review. But I thought it was totally different. I didn't like WAKE at all. But I really liked this one!